Train travel in Russia is a little like to going to a desert island or up to the top of a mountain – you are completely cut off from the world, so it’s best to just sit back and enjoy the ride. I made the train to Perm with 10 seconds to spare as a result of chemical burns and a complete lack of food. My friend Juliet and I had decided to travel part of the Trans-Siberian railway during my two-week vacation from work. She, alas, had arrived in Moscow from the UK with a special boot on her foot suffering from chemical burns. To say that she had a limp would be an understatement. We arrived at the station with time to spare and focused ourselves on finding platform 1, and the train to our first stop on the railway, Perm. Having accompanied Juliet to the platform, she insisted that I dash off to buy provisions for our 28-hour journey while she hobbled with our bags down the train to wagon number 12. The line in the small convenience store was long but, having lived in Russia for a while, I had picked up some tricks. I stuck a basket in the line and then ran around the shop selecting staples such as bread, noodles, cheese and more noodles. Loaded down with bags, I started towards the platform. Traveling from Moscow to Irkutsk took us nine days, including stops off in Perm, Ekaterinburg, Krasnoyarsk, Ulan-Ude and Irkutsk. We spent an additional week on Olkhon Island in Lake Baikal. 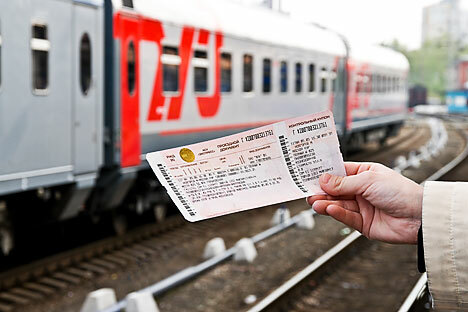 Our tickets cost us Tickets to Irkutsk cost about 7,000 roubles travelling third class in August. Booking through the official Russian Railways site (rzd.ru) is generally cheaper than using travel agents. At the platform, I proceeded down the train past wagon number 11 to wagon number 12 – except it wasn’t there. Thinking I’d perhaps made a mistake, I walked to the next wagon to find that it was 13. Wagon number 12 simply didn’t exist. Wondering slightly if I should take a run up and head for the couplings between wagons 11 and 13 – Harry Potter-style – I asked the provodnitsa (wagon attendant) for number 12. Increasingly desperate, as she told me with an obvious grin that it was next to 11, I started jogging up and down the train calling out Juliet’s name as the minutes ticked away. Our train left at two minutes past eight, and by eight o’clock I still hadn’t found it. Sensing my desperation another, more kindly, provodnitsa asked me where I was going. “Perm!” I shouted. “This train doesn’t go to Perm!” she shouted back in reply. “That one does though!” she said, pointing at the train on the opposite side of the platform. I had been looking to board the wrong train. In my haste, I had forgotten to employ Russian logic and had assumed that platform 1 would be the one at the furthest edge of the station. Instead, platform 1 was in the place that I thought platform 2 should have been. Running towards the other train, my bag burst open and my purse exploded onto the ground. Grabbing my money and cards and leaving a little trail of paper behind me I heard someone shout “just get on anywhere!” Spying Juliet towards the end of the train, I gestured to her to get on and hurled myself up the steps at a shocked attendant. Ten seconds later, the train began to move. Thus began our Trans-Siberian adventure. Train travel in Russia is a little like to going to a desert island or up to the top of a mountain – you are completely cut off from the world. The trains aren’t connected to the Internet and phone calls, even from Russian cell phones, are expensive, so it’s best to just sit back and enjoy the ride. But in order to traverse Russia, all you need is time and a bit of money: Juliet and I traveled third class the entire way – our most expensive ticket was for about 3,000 rubles ($100) from Ekaterinburg to Krasnoyarsk, which covered about 1,485 miles (2,389 km). Train travel is a relaxing business: If you are in third class or above, you get your own flat bed and your only real concerns are eating and sleeping: Juliet and I did a lot of both. To make the train your home away from home, it just takes a couple of light touches and a bit of preparation and you’ll never want to leave. In order to enjoy the journey, it is important to realize that, surprisingly, Russians are rather sensitive to the cold. At almost all times of the year, therefore, train wagons are likely to be roasting. But fortunately for us, the window of our carriage actually fell off the train into the compartment two hours into our journey from Perm to Ekaterinburg. This turn of events caused several people to squawk in horror that they would catch a chill – even though it was a temperate 20 degrees celsius (68 degrees Fahrenheit) outside. To be prepared for this situation, it is therefore a) sensible to choose a train with a lower train number, as they are of a better quality and b) a good idea to take clothes that are light and cool as well as wet-wipes, which serve the dual purpose of cooling you down and providing relief from the grime. To get a good night’s sleep, bring ear plugs and an eye mask as well as a warm sweater and flip-flops: the sweater can be used as an extra pillow and the flip-flops are a more practical alternative to outdoor shoes. When preparing for the train, Juliet and I thought that we had covered all potential train pitfalls and that we had packed admirably for the job at hand. Although we took books, music players and a deck of cards to break the ice with fellow passengers, we found, after a few days on the train, that we had hit a snag in the kitchen department. Upon closer inspection, it appeared that the Russians in our carriage had come prepared with dinner services (complete with teacups and saucers) while we, on the other hand, had one blunt knife and a fork between us, a Tupperware box and two mugs. Although asking to borrow kitchen implements is an excuse to get to know your fellow passengers, it is a good idea to come better prepared so that, when you do buy the all-important smoked fish, you can eat it without looking like Dracula. Fish is a key part of any train journey – the smell of it hangs around the carriages mixed in with the odor of dill, boiled potatoes, noodles and sweat. It is not unpleasant, but it is certainly noticeable after clambering back on the train after a 20-minute stop in the fresh air in the middle of Siberian nowhere. The great thing about train travel is that you get to see many places without actually having to go anywhere: the train trundles past small villages and dachas and then stops in a cacophony as people run down the carriages selling toys, beer, dried fish, meat pies and ice cream. Then the whistle blows, everyone packs up and jumps on the train until the next stop, where it happens all over again. Back on the train, all the new purchases come out and they are shared around the small compartments in the wagon; dill potatoes are swapped for small pies or sausages. Russians are incredibly hospitable, so it is best to have enough food to share and offer in return. Sharing food with your fellow passengers is also a good way of encouraging them to look out for you and your belongings – especially if you are traveling on your own. Dinner on the train is frequently washed down with beer or hot black tea bought from the provodnitsa. These attendants are usually women and spend their working lives traveling all over Russia. During our journey to Perm, brunette Nadezhda and blonde Tatiana explained that they work for nine days on the train and then have nine days off. Their job is tiring, difficult and takes them miles away from their families. A big smile can go a long way with the provodnitsa, who can also sell you cheap snacks and give you tips on places to visit along the way. Fellow travelers are also happy to help with requests for information – the route to Lake Baikal and Mongolia is populated with foreigners of many different nationalities, so if you don’t speak Russian, you shouldn’t feel too lost: after days on a train it becomes one big happy family.